Agilent Technologies (spun off from Hewlett Packard in 1999) maintains a clear focus on analytical measurement and has leveraged its considerable expertise in chemical analysis into the creation of a large portfolio of life science tools. Agilent analytical systems, bioinformatics software, and lab automation solutions are used in labs around the globe. Since launching a major line of liquid chromatography and mass spectrometry systems in 2006, Agilent has quickly become a leading provider of tools to measure proteins in biological samples. The company’s relentless innovation has raised mass spectrometry to unheard of levels. This combination of state-of-the-art analytical and automation platforms, software development capabilities, and chemistry expertise makes Agilent uniquely poised to address the needs of rapid growth and stringent data quality requirements of biologics discovery and development. Mass spectrometry (MS) coupled with liquid chromatography (LC) has emerged as the most versatile analytical strategy for targeted protein analysis. From monitoring large-scale production processes to the discovery and validation of protein biomarkers, the use of targeted MS for protein analysis is an appealing alternative to ELISA-based assays due to the ability to multiplex protein targets and achieve high levels of specificity and sensitivity. A key and often rate-limiting requirement for the implementation of MS-based protein analysis is sample preparation, which involves protein denaturation, reduction, alkylation, in-solution trypsinization, and peptide cleanup. Sample preparation is typically performed in a manual or semi-automated fashion that leads to variable results and is often the bottleneck in the entire protein analysis workflow. In response, Agilent Technologies has developed solutions on the AssayMAP technology platform for sample preparation that facilitate reproducible, robust, high-throughput quantification by mass spectrometry or other high-performance detector. AssayMAP technology intelligently automates complex protein sample-preparation workflows, enabling larger campaigns, deployable methods, and improved data quality for methods that have been previously limiting. 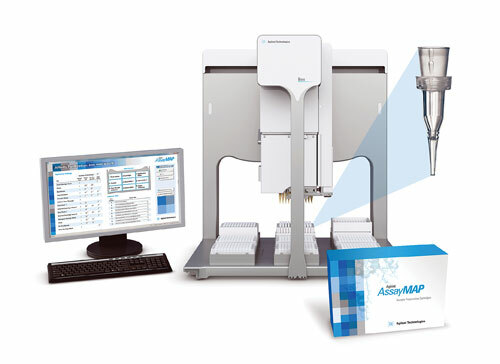 The AssayMAP technology comprises three main components: a specialized Agilent Bravo Automated Liquid Handler equipped with positive displacement syringes, miniature chromatography cartridges packed with resin appropriate for each application, and an optimized protocol with a simple user interface that runs at the push of a button. Each workflow is designed to have maximum assay development flexibility controlled through simple inputs on a computer interface. Figure 1. (A) Schematic representation of the basic protein quantification work flow: Samples are denatured, digested, cleaned up, and then analyzed by mass spectrometry. 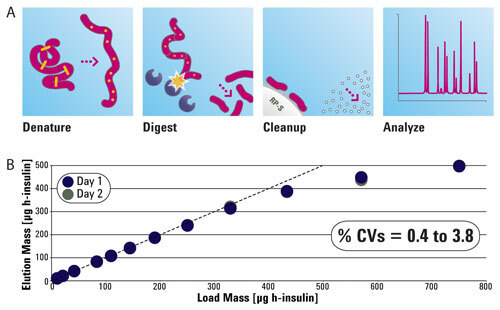 (B) Quantitative, precise, and robust cleanup using the AssayMAP platform: A 12-point serial dilution of insulin (n=8 per point dilution) was processed using the AssayMAP Peptide Cleanup module and a full rack (96) RP-S cartridges. The robustness of the system was tested by repeating the cleanup on two different days. The mass of the insulin in the elution was plotted against the mass of the insulin in the input sample. The identity line is shown. %CVs were determined for each dilution and found to range from 0.4 to 3.8. A key step in the protein analysis workflow is the removal of denaturants, salts, solvents, and particulates from protein digests. For peptide cleanup, the most common strategy is to use vacuum or centrifuge-assisted solid-phase extraction, requiring laborious multistep liquid additions. In contrast, AssayMAP technology relies on precision, flow-controlled microchromatography to provide walk-away automation of peptide cleanup. The AssayMAP peptide cleanup protocol allows the user to load up to 245 µL of digested protein onto a reversed-phased cleanup cartridge and quantitatively bind complex peptide mixtures with minimal bias with high levels of recovery, even at sub-microgram load levels. In less than an hour, the AssayMAP peptide cleanup protocol using RP-S reversed-phase microchromatography cartridges can process up to 96 samples in a single run, producing robust analytical performance with CVs consistently less than 5%. Elution from the cartridge can be achieved in as little as 10–15 µL, resulting in a concentration factor as high as 24X, accelerating time-to-results by rapidly producing plate after plate of mass spectrometry-ready peptides. This workflow is part of a growing line of automated sample preparation solutions that simplify sample-preparation for bioprocess and other proteomics applications. Figure 2. The three main components of the AssayMAP technology are a specialized liquid handler with positive displacement syringes, miniature chromatography cartridges, and an optimized protocol with a simple user interface.